Bluetooth speakers are the number one cellphone accessory bought in today’s day and age. Make them splashproof, and they meet a niche market of people who want to listen to music poolside, lakeside, or just bath side. For the best sound quality at a low price, consider the four following water-resistant wireless Bluetooth speakers. Our gold pick, the JBL Flip 3 has awesome sound and great connectivity, while the silver pick, the TDK Life on Record Trek Max, has great sound quality and a unique design. The bronze pick, the Omaker M4, has a simple, rugged design with decent sound quality, as does the budget pick, the Victsing Wireless Bluetooth 3, but for half the price. All four speakers have their proper place and function, so look out for the features you need in a water-resistant wireless Bluetooth speaker. Then read on to learn about the four things to consider before buying one. The JBL Flip 3 is a top tier wireless Bluetooth speaker. AT just seven and a half inches long, this cylindrical speaker has a diameter of about four inches, and weighs 1.5 pounds. Compact and lightweight, the Flip 3 easily fits in a backpack. In the box you will find the Flip 3 wireless Bluetooth speaker, a three foot micro-USB cable, a user’s guide and safety sheet, and the warranty card. 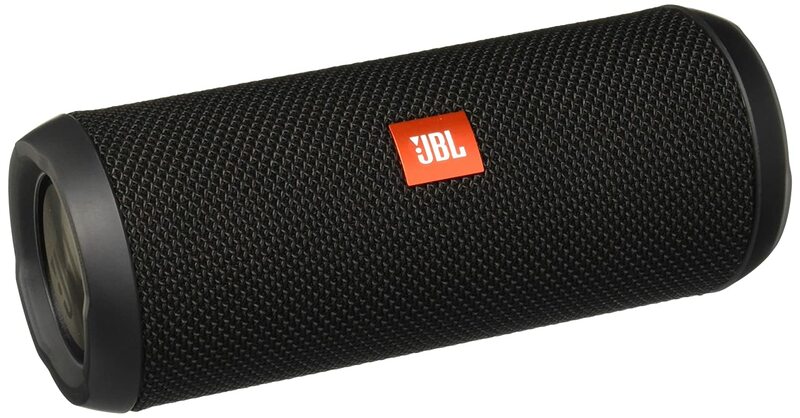 This device comes with a five-year limited warranty,, but you are not likely to need it because the speaker is durable enough to withstand a fall and comes with superior JBL technology. 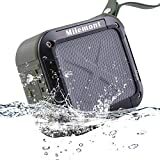 As an all-weather, splashproof Bluetooth speaker, the unit best functions in the outdoors or poolside, but can also be brought into a shower provided it is not directly in the line of spray. The Flip 3 is powered by a strong 3000 milliamp hour lithium-ion battery, giving it up to ten hours of listening pleasure, and charges in about three hours. It comes fully charged out of the box so you can connect and use it immediately. To save energy, the speaker turns off automatically after thirty minutes while running on a battery or goes into standby mode while running on the charger cable. The cylindrical shape is nothing new, but the modern design makes other speakers look like antiquated appliances. The buttons’ layout is easy to distinguish and remember. There is a band in the back which houses the power and JBL Connect buttons. All of the other buttons are among the fabric. These buttons include Bluetooth reset, volume up and down, and the play/pause button. Double tap the play/pause button, and the audio skips to the next track. Unfortunately, this unit does not allow for a triple tap to skip back to a previous track. The device can be placed in one of two positions: horizontal or vertical. When in horizontal positioning, the speaker rolls and would roll away if not for the shoelace-style lanyard, which acts as a kickstand of sorts. It would be nicer to see an actual kickstand or even feet to prevent roll-away speakers. When in the vertical position, you do not have to worry about it rolling away, however you do have the slightly lessened bass due to one of the mini subwoofers being on the bottom. This, however, is the only stable position unless you place the speaker on a surface that prevents rolling, such as grass. This device is also available in seven different colors: black, grey, teal, yellow, pink, orange, and blue. Though the Flip 3 has no carrying case, it does not seem to need it, as it is durable and has the useful lanyard to attach it to things. When you first turn on the Flip 3, you will be welcomed by (much too loud) welcoming tones. Once past them, you can pair the device using manual pairing only. While pairing, you will hear more of the loud guitar arpeggios that welcomed you. This unit can connect to up to three output devices at once, and will pair with the first one to activate Bluetooth. Through JBL Connect, the speaker can also connect to other speakers with JBL Connect technology to provide more stereo sound and higher volume (as if you needed higher volume). The Flip 3 has an awesome sound quality that matches that of much larger or pricier speakers. First of all, the volume goes up to ranges that will suit anyone’s needs, whether a party or drawing in customers from a block away. It has warm lows and well-defined high’s, helped along by a mini subwoofer on each end of the speaker. Along with a JBL bass radiator, these subwoofers make the earth rumble and the house shake. On the other spectrum, the trebles are detailed and natural-sounding. The only disadvantage is a little distortion with some tracks at maximum volume. Along with being a speaker, the JBL Flip 3 can take calls and act as a speakerphone. For these calls, it has a built-in microphone that produces crystal clear sound at several feet away. In addition, there are noise and echo cancelers to ensure the only audio on the call is your voice. Rain or shine, the sound is fine. The Trek Max is a great splashproof speaker with undistorted sound quality even at maximum volume. It is a little large at 9.5x2x3.8 inches and a little hefty at two pounds, eleven ounces. However, the weight is evenly distributed top to bottom and side to side, so it does not seem to weigh almost three pounds, and the weight is certainly made up for with the sound quality and durability. A rugged Fugoo-style speaker, the Trek Max has onyx-black edging around its silicone and rubber feet for stability. On top, you will find the Bluetooth, power, and volume buttons, followed by the phone button, and the track controls previous track, play/pause, and next track). The power button is very sensitive; press and hold it for just a second and release or it will turn the device back off again. Performance of this speaker is not affected by its use of Bluetooth 2.1 technology. The Bluetooth range is an average thirty-three feet before objects between the unit and the output device starts to distort or disconnect the sound. It also uses near-field communication to connect with ease. Just touch your output device’s NFC tag to the speaker and it will immediately ask you if you want to pair. Tap yes and presto! Your speaker is paired in an instant. This speaker can be extremely loud at its higher volumes (up to 15 watts of sound), while not loosing quality. The complete audio (not just the bass) will travel well over distance. One person said it most accurately when he noted that this was a “warm speaker that emphasizes bass.” While the high’s are detailed and well-defined, the speaker shines with its bass, which will shake the ground you stand on. Best when the device is on a wooden surface, the bass is provided by two subwoofers, with the bass exhaust on the back. There is also a multi-gradient driver which helps the mid’s and high’s be so detailed and clear. With its amazing maximum volume, one would think it would lose quality at the higher volumes, but it does not, other than the upper high’s becoming slightly harsher. IF anything, the sound quality is enhanced at its higher volumes because that is where the bass is truly magnificent. This unit also has good 360-degree sound. 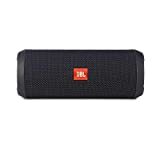 Sadly, while there is some stereo sound if you are close enough, it is not very discernable, and there is no way of connecting this speaker with another for stereo sound like the JBL Flip 3. Finally, the volume of the Trek Max is integrated with that of Apple devices, so turning up the volume on the device turns up the volume on the speaker and vice versa. Like the other speakers reviewed, the Trek Max has an integrated microphone for phone calls. However, unlike the JBL Flip 3, it does not have the noise and echo cancelations, leaving the person on the other end with echoes or extra noise like humming. AN additional feature of the speaker is that it wraps the playlist when it ends, starting over at the beginning. This feature is especially useful for parties. Feature-rich, this speaker is a true silver pick. A small 3.2-inch square, the Omaker M4 is not the most impressive speaker, but what can you expect from something this small? Easy to fit in a backpack or toolbox, it will almost fit in a pocket and weighs only 8.2 ounces. While the sound quality is a little lacking, it sounds better with the spoken word. The rugged design makes it quite durable, able to handle multiple drops. This speaker comes with a USB cable for recharging through your laptop of desktop, a 3.5mm audio cable, a durable plastic lanyard, and the user’s manual. The device also comes with a one-year, worry-free guarantee, great for those “just in case” times when you get a defective unit. The Omaker M4 is IP54 certified for sand- and water-resistance this allows the speaker to be taken into the shower, and it can hold up to soaking, though it is not submersible. A strong 1500 milliamp hour lithium battery keeps the speaker going for a womping twelve hours at eighty percent volume. This amazing battery takes only three hours to charge on the USB cable. The rugged square design is nothing impressive to look at, but it does the job. To continue the rugged, outdoors-y design, it comes in either an army green or orange hard plastic case with rubber gripping. In the center is the large cavity speaker, surrounded by the ports and buttons. On the side are two ports, the micro-USB port and an auxiliary port, both covered, as well as a reset pin button. Make sure these ports are completely covered before taking this speaker into rain or the shower as any seepage of water into the ports will damage the entire unit. On the top of the speaker are the main controls. From left to right, they are power, play/pause/call, volume up/next track, and volume down/previous track. Unlike many speakers, the volume and track switches are reversed. Press quickly on the volume/track button to skip tracks and press and hold to change the volume. Using the latest Bluetooth 4.0 technology, the Omaker M4 can connect almost instantaneously. It can use NFC to pair quickly and easily or be manually paired within three seconds. This speaker can also be connected to up to three devices at once. If all output devices are on, the speaker will connect to the first one to activate its Bluetooth feature. The only unfortunate thing about the Bluetooth connectivity of this device is that it has a ten to twenty-five foot range, rather than the usual thirty-three feet. With a three watt output, the M4 does not have much punch in the sound department. The bass is discernible, but do not expect it to shake a table, let alone a house. The mid’s are missing a great deal of detail, but that is made better with spoken word. The highs have good detail, but are harsh, with electric guitars sounding tinny. The audio has some distortion at high volumes, but that is less noticeable with audio books and podcasts. Finally, the sound from the speaker carries about twenty feet. Like the other speakers, this one has a built-in microphone for phone calls, but the person on the other end hears an annoying humming sound, and there is no noise cancelation. Overall, this speaker is good for listening to audio books or podcasts in the shower, but not much else. The sound quality is below average compared to the gold and silver picks, and the features are bare minimums. The lightest of the speakers reviewed, the Victsing Wireless Bluetooth 3 is a mere three-tenths of an ounce! Five inches long and 4.8 inches in diameter, this speaker is almost a perfect circle and its design quickly reminds one of a tire, and , For its size, the sound quality is actually pretty great. In the box, you will find a twenty-inch USB cable for charging via laptop or desktop, a camping snap hook, a suction cup, a carbine, and a user’s manual, which is rolled up and crumpled in the packaging. One would hope Victsing had more respect for their user’s manual than that shows. The device does come with a forty-five day money-back guarantee, though, on top of a one-year worry-free warranty. The Victsing Wireless Bluetooth 3 has a silicone case that is shock-, sand-, and water-resistant. Like the others, however, it is not submersible. Using a 500 milliamp hour polymer battery, this speaker can remain charged for up to six hours at seventy percent volume, and takes three hours to charge with an AC adapter. To conserve energy, the Victsing Wireless Bluetooth 3 will shut down automatically after fifteen consecutive minutes of not being used. With a simple, rugged design, this speaker is intended to look just like a tire. Like a tire, however, it would roll away if not for the lanyard loop. The design does, though, allow for easy, one-hand grip. Available in army green, grey, and light blue, the unit has a hard net frame in front of the speaker to prevent physical contact. The buttons are around the exterior of the speaker. There are only four of them: power, volume up/next track, volume down/previous track, and play/pause/call. Similar to the Omaker M4, the Victsing Wireless Bluetooth 3 has the volume and track controls reversed, with a quick press changing the track and a longer press changing the volume. Unfortunately, the buttons’ functions cannot be read while in the shower and must be memorized in a clock-like fashion, but since there are only four, that is not too hard. Both the suction cup and metal camping hook are detachable, allowing for versatility of placement. The suction cup secures to the bathtub wall very well, to t he point that it has to be scraped off with the fingernail since there is no lip. The suction cup also moves around a lot on the wall. 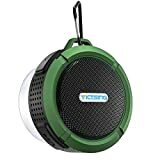 Victsing says it is certified IPX5, which would allow for direct spraying of water, but the speaker’s sound quality goes noticeably down after direct spraying and never returns to normal. Splashes are fine, however. Turning the speaker on, you are greeted by a female voice practically shouting “Power On.” The same voice says “Power Off” in the same, extremely loud way. There are no settings for changing this. Once you get past the blast to your ears, pairing the device is simple. The Victsing Wireless Bluetooth 3 uses Bluetooth 3.0 technology, which makes pairing quick. The unit also has a Bluetooth range of approximately thirty feet. The Victsing Wireless Bluetooth 3, too, has an integrated microphone for calls, but there are two problems with it. First, you cannot be heard if you are more than a foot away from the microphone, closer if you are in the shower. Second, the other person hears a strong echoing on the line, making conversations almost impossible. Overall, however, this speaker is very decent for its price and size. Plus, it is the most versatile when it comes to where to hang it, as it has three ways: suction cup, metal camping hook, and lanyard. What do you need the speaker for? What functions does it have to meet that need? For example, if you are only going to use the speaker in the shower and at mid-range volumes, you likely will not need the booming power of the Trek Max. 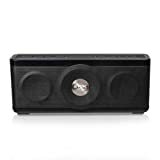 If you need the speaker to work as a speakerphone, you will have to eliminate the Victsing Bluetooth Wireless 3 because it is useless in that department thanks to the severe echoing. Other functions to consider are type of audio you will play, how far you need the sound to reach, and how many people will be listening to the audio at once. Complicated speakers are not likely to get much use because you will have to memorize button patterns, read the user’s manual repeatedly, and/or struggle with making it work. Good connectivity and simple button controls make all four of the reviewed speakers a good choice as far as ease of use goes, but the quick-to-find buttons on the Trek Max or Flip 3 make them the best choices for easy use. If you want crystal clear audio, exnay on the Omaker M4. Its sound quality really just does not cut it. You will likely want ground-shaking bass and detailed and comprehensible trebles. If sound quality at extreme volumes is your thing, go for the Flip 3 or Trek Max, and if you want to rumble the earth, you will certainly want the Flip 3 from JBL. You will want the fastest connection that your speaker and your output device can produce combined. Therfore, you do not need Bluetooth 4.0 technology if your cellphone only has 2.0, and why would you want to limit yourself to 2.0 if your cellphone has the latest 4.0 technology? The ability to use near-field communication may also be a big factor in connectivity, if your output device has an NFC tag. If it does, try out the Trek Max or Omaker M4 for their NFC capability. Connection to multiple devices and connection to other speakers are other things to keep in mind in this category. While all of the speakers reviewed are good at what they do, the shining stars are certainly the JBL Flip 3 and the TDK Life on Record Trek Max. These two speakers have the sound quality for enjoyment at the softest volumes or the loudest blasts, and have many features to make them star products to have around your home. If you are just looking for something to take in the shower and sing along to, there is the Omaker M4, and for its size, the Victsing Wireless Bluetooth 3 is quite the deal. Consider your needs and wants, and choose the product that fits your lifestyle and budget.